Do you like to move it, move it? Well, if you do, you’re probably familiar with the 2005 Dreamworks film Madagascar. If you’re not familiar with it and it’s sequels, it’s a cute computer-animated feature about four unlikely animal friends, a lion, a zebra, a giraffe, and a hippo, from the Central Park Zoo who find themselves on the island of Madagascar, realizing what it is to be in the wild. Red Branch Theatre Company’s latest offering, Madagascar, A Musical Adventure, with a Book by Kevin Del Aguila and Music and Lyrics by George Noriega and Jose Someillan, is the stage version of this popular film, Directed by Jenny Male, with Music Direction by Dustin Merril, and Choreography by Angeleaza Anderson, Sarah Luckadoo, and Jenny Male, is fun, energetic production perfect for this time of year when you need a break from the crazy mid-Atlantic weather and the hustle and bustle of the holidays. Set Design by Jacob Cordell is minimal but appropriate and sets the scenes cleverly. Using set pieces, it’s easy to determine where each scene is placed and Cordell decorates the set festively that works quite will with this piece. A highlight of this production is Choreography by Angeleaza Anderson, Sarah Luckadoo, and Jenny Male. 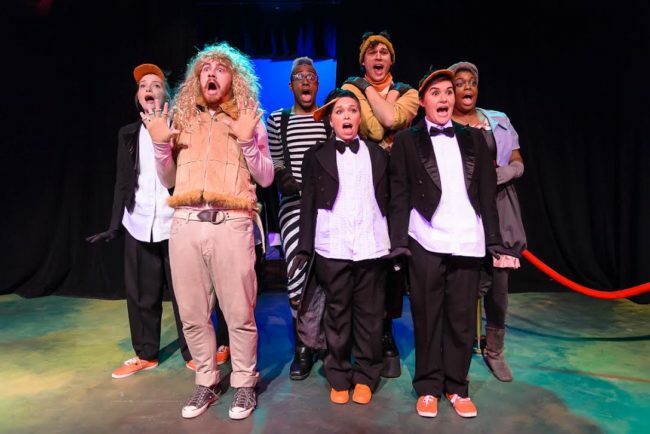 It’s contemporary, high energy, tight, and the ensemble performs it well, adding great value to the production as a whole and keeps the attention of the targeted, younger audience members. Costume Design by Jackie Rebok is well thought-out, flashy, and fanciful, as it should be. With the risk of doing too much for a character when it comes to people playing animals, Rebok’s design is intelligent in that it doesn’t inhibit the actors performances but gives the audience just enough to know which animal is being portrayed. Simple, but spot on, each costume is quite appropriate and adds great value to this production. On a personal note, I think the platform boots for Melman the Giraffe are everything and a clever touch to the character. Music Diretion by Dustin Merrill is focused and commendable and, even though the production uses recorded music (I’m assuming, since there wasn’t a pit orchestra listed in the program), his cast his well-rehearsed and committed. The score is very pop-inspired and quite catchy. The tunes are hummable and the ensemble has a good grasp of the music making for a delightful production. Jenny Male takes the helm of this production of Madagascar, A Musical Adventure and her vision and staging of this piece is superb. She doesn’t treat this material simply as a “kids show” but as a quality production. It’s a fluffy show that’s meant to be more fun than anything, but it does have a message of belonging of which Male has a strong comprehension and her vision is clear. Her casting is spot on and her staging keeps the piece moving along nicely with smooth transitions and a peppy pace. Speaking on the performances of this piece, it’s worth noting that every single ensemble member is 100% committed and gives dedicated, strong performances. They all work well together and take the piece seriously enough to get the message across but also have fun with the material making for an engaging evening of theatre. To begin, Rick Westerkamp takes on the role of the over-the-top, zany King Julien and Megan Henderson takes on the character of the business-like assistant, Maurice. Overall, these two give confident performances and are comfortable in their roles, but Westerkamp takes the over-the-top a little too far and it actually hinders his performance. It’s as if he’s trying too hard for the laugh and the portrayal falls a bit flat. Vocally, he’s not the strongest and with one of the most recognizable, catchy songs in the entire production, “I Like to Move It,” one would think this number would be the most memorable. The choreography is spot on but Westerkamp seems to be just going through the motions, depending on the assumption that the audience will find it humorous. Ben Ribler tackles the role of Alex the Lion, the star of the Central Park Zoo and a carefree, kept creature that takes advantages of all the privileges that entails. Ribler’s character work is admirable and, vocally, he makes a very good showing but it is a subdued performance, lacking energy at times, and he seems to be so soft spoken, it was difficult to make out his dialogue through much of the performance. However, aside from a few minor issues, he has a good presence, understands his character, and seems to be enjoying the role which transfers to the beguiled audience. 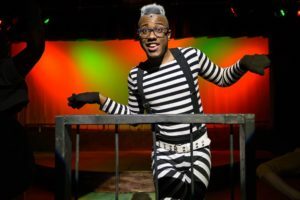 Performing the role of Marty the Zebra is Bryan Thompson and he has a great grasp of this character and his need for freedom. Thompson’s delivery is commendable and his dedication is apparent for this role. Vocally, he may not be as strong as others in the ensemble, but he holds his own nicely and has great chemistry with his cast mates. Overall, it’s a notable performance and his enjoyment of playing this role shines through. Though supporting characters, The Penguins are probably some of the most popular characters in this piece and Liliana Evans as Skipper, Angeleaza Anderson as Private, Sarah Luckadoo Rico, and Molly Mayne as Kowalski give a hilarious showing as these determined arctic fowls. They have a brilliant chemistry and work well together. Each actor portrays the individuality of each character and give the Penguins a near perfect balance of hard-nosed, military purpose and compassion for their fellow animals. Kudos to Evans, Anderson, Luckadoo, and Mayne on their wonderful performances. Danny Bertaux is a highlight in this production as Melman the Giraffe. Melman is such a quirky character, but Bertaux pulls off a stellar performance. He embodies this character who suffers from severe hypochondria and endears himself to the audience. He works quite well with and off of his cast mates and adds a certain charm to this character. It’s worth mentioning, also, that he keeps up with the intense choreography in exceedingly high platform boots (that I absolutely adore) without missing a step. Overall, a praise-worthy performance. 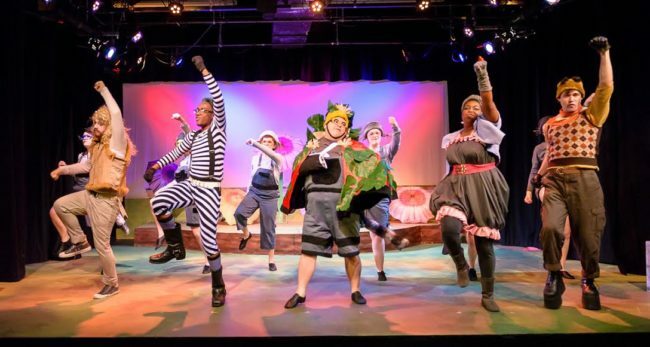 In this particular production, Taylor Washington as Gloria the Hippo as the standout. This lady has a voice on her that soars throughout the theatre and makes one take notice. She’s committed to her role and adds a maternal aspect that is required of Gloria. Her chemistry with her “boys” is spot on and she takes the material seriously enough to tell the story but also has fun with the role that balances out to be a superb performancce. Final thought… Madagascar is a cute, fun, and energetic staged version of the popular 2005 film and it transfers nicely to the stage. The music is pop-inspired and damned catchy, that you may find yourself humming on your way out of the theatre. The performances are committed and the ensemble is strong. You don’t have to be familiar with the film to enjoy this family-friendly, fluffy, and thoroughly entertaining piece of theatre. This is what I thought of Red Branch Theatre Company’s production of Madagascar… What did you think? Please feel free to leave a comment! Madagascar, A Musical Adventure played December 8-23 at Red Branch Theatre Company, 9130-I Red Branch Road, Columbia, MD.